Have you ever received spam or suspicious emails that you didn't know what to do with. Whenever this happens it is very important that you report these types of emails to Google. The more reports of Spam they get on emails the better their filtering algorithms will become. 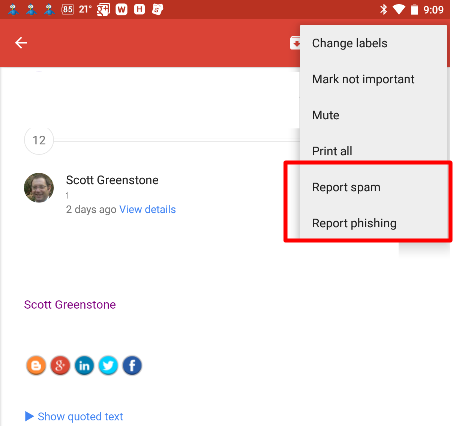 The more reports of Phishing schemes helps Google protect their user base by giving them more information to filter and prevent this from entering our inboxes altogether. 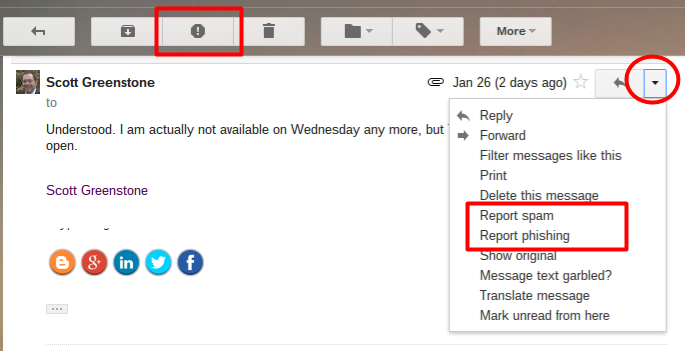 So here are the steps for reporting spam/phishing in Gmail. There is no 'report phishing' option in my gmail app. Only 'report spam'. Somebody said that's because when gmail automatically recognizes a mail as a phishing attempt, it removes the 'report phishing' optoion. However, that doesn't make sense, because the big G ain't stupid, and gmail would probably have indicated in some way that it suspects the mail is phishing - which it doesn't. It used to be on the Android mobile Gmail app, but Google has since removed it for some reason.